LOD, Israel – Israel Sci-Tech Schools collaborated with Israel Aerospace Industries (IAI) recently for “Take-Off-for-Tomorrow” day at the Israel Sci-Tech-Aerospace Technological High School at Israel Aerospace Industries’ (IAI) campus in Lod, Israel, a program designed to encourage innovation and excellence in technological education in Israel. The nearly 14-hour, day-long program engaged senior engineers from IAI and dozens of 10th, 11th and 12th grade students selected from 13 schools across the Sci-Tech network. A month before the “Take-Off-for-Tomorrow Day”, the 6 student teams were presented with real-life challenges. The students presented their ideas for technological solutions that solve various real-life challenges to the IAI engineers for their comments and feedback. Throughout the course of the day, the engineers assisted the students in advancing their ideas and creating a work plan in order to produce a prototype for each product. 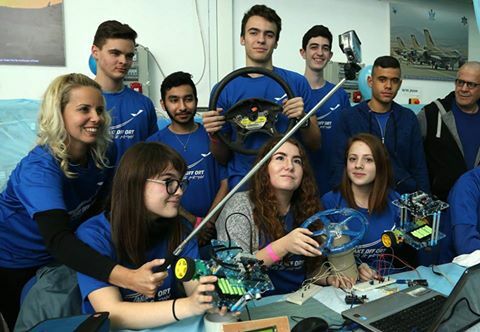 At the end of Take-Off Day, three models were created using unique methodology implemented by Israel Sci-Tech Schools for issues that were raised by the students. The first solution was for travelers in hot and dry areas – a system that detects and prevents hypothermia. The second idea was for a smart car that can detect if a drunk driver is at the wheel, responding by locking the car’s engine and sending location coordinates to the drivers’ relatives. The third plan was for a way to limit the range of drones used by paparazzi. Israel Aerospace Industries is a globally recognized leader in the development and production of systems for the defense and commercial markets. IAI offers unique solutions for a broad spectrum of requirements in space, air, land, sea and cyber. Over the past 60 years IAI delivered, supplied and supported advanced systems for the Israeli Ministry of Defense as well as many demanding customers worldwide.